Are you all having as difficult time as I am getting up and off to work today? It is always nice to have a long weekend….but difficult to get back into a schedule! We did have an opportunity to get out and Enjoy Life a bit this weekend! We spent the weekend camping on the beach of Long Island Sound and enjoyed one 90 degree/sun-filled day on the beach before the cold rain set in! 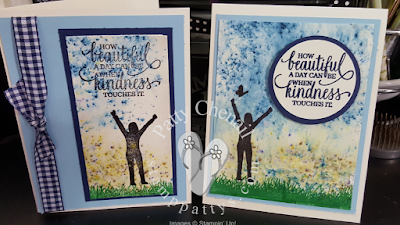 Today I am sharing a couple of projects I created using the Brusho powders and a brand new stamp set called “Enjoy Life“. I used the new color balmy blue as one of the layers, accented it with Night of Navy, and stamped my person image as a shadow using black ink! I’m also sharing a video I did not long ago to show you just how easy brush is! Although I used watercolor paper in the video, I wanted to let you know that I created these projects using our very vanilla cardstock. I used my heat tool to speed up the drying process!